Wrist spinner Kuldeep Yadav’s sensational show during his maiden Test on Australian soil makes him India’s first-choice spinner when it comes to selecting the playing XI for the upcoming World Cup in England feels team coach Ravi Shastri. 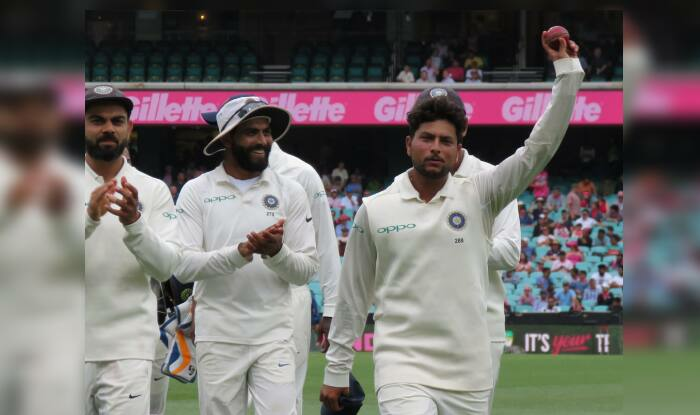 Kuldeep returned with a five-wicket haul in the first innings of the drawn fourth Test in Sydney against Australia and the wrist-spinner received huge accolades from the India coach. “Kuldeep comes into the mix big time now (in the World Cup),” Shastri told India Today TV channel. “He might be in every Indian XI that plays (in the World Cup) because he has the advantage of a wrist spinner. We might need to choose between the other two finger spinners because wrist spinner now is the priority.” Young wicket-keeper batsman Rishabh Pant also impressed by scoring 350 runs at an average of 58.33 to emerge as the second leading run-scorer for India during the four-match Test series against Australia. India won the contest 2-1 to clinch their maiden Test series win on Australian soil. However, the 21-year-old Pant, who scored an unbeaten 159 in Sydney, was not included in the squad for the Australia and New Zealand ODIs. Shastri said Pant has been given a specific job of learning to finish games, which will be important for India during the World Cup. “We have asked him to go back because he has been playing non-stop cricket. I think he needs a break for a couple of weeks and then join the India A team,” the India coach said. “He has been asked to do a specific job, to get into the habit of finishing off matches and he will be right there in the mix,” he added. Shastri again slammed the critics for “jabbering away”. “Who cares what people say? Look at the scoreboard, look at the results and rests is history, you can keep jabbering away.” he said. “I always believed the people who jabber away are in the minority. You don’t know the millions of fans that this Indian team has, you outnumber the jabbering crowd.” Virat Kohli and Co. will now take on Australia in the three-match one-day series starting in Sydney on Saturday.